The mystery why did kattappa kill baahubali is finally solved with the release of movie Baahubali 2 – The Conclusion. Furthermore, the visual effects, stunts and box office collection of the movie is about to set new benchmark in Indian cinema. 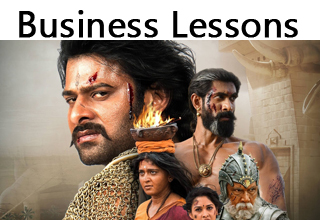 In addition to illuminating above suspense baahubali 2 movie also teach us several business lessons. So, let’s take a look at what baahubali 2 movie teaches us about business. In baahubali 2, it is shown that when kingdom of Kuntala was attacked by Pinjaries, Amarendra Baahubali uses out of the box thinking and defeat a big army by using combination of fire, animals and water. Learning – Innovation is the only way to win and compete in big market. You can lead the market by innovation. Innovation is not the result of chance, it’s the result of action. It’s not thing a think to wait for. It’s a thing to do. In baahubali 2 movie, it is shown that Amarendra Baahubali inspires swordsman Kumar Verma to fight. Kumar Verma accept it as transformation opportunity and flight against enemies bravely. Learning – If you motivate people in adverse situation they can lose their fear and excel in performance. Embrace each challenge in your life as an opportunity to self- transformation. Although, baahubali was declared as commander-in-chief instead of king, he maintain balance state of mind. He gave due respect to Bhallaladeva. Even though baahubali and devasena was banned from the palace, they happily lived with people of maheshmati. Learning – In order to become successful in life one should accept every situation gracefully. You may not be able to control every situation and its outcome but you can control your attitude and how you deal with it. In baahubali 2 movie, Sivagami give commitment to Bhallaladeva about his marriage with Devasena. At the time of making commitment to him she was unaware of the fact that Baahubali was in love with devasena and devasena may not agree for the marriage. The unrealistic commitment by Sivagami was root of misunderstanding between Sivagami and Baahubali. Learning – In the world of business entrepreneur should never give commitment on behalf of someone. One must assess own financial reality and other data before giving any commitment. In the movie it is shown that anger of Sivagami towards Baahubali and Devasena inspire her to take wrong decision of banning them from the Palace. Learning – Anger doesn’t solve anything. It builds nothing but it can destroy everything. So, never make a decision in anger and never make a promise in happiness. Amarendra baahubali was very humble and respectful towards people of Mahismati. Although he was from king family he live very simple life with people of Mahismati. He helped people in their regular work and came up with solution to ease people’s day to day problems. Learning – In business one should build and sell the product that help’s customer. Human touch is very important in success of any business. In the movie, Bhallaladev produces scene in front of Sivagami that Baahubali wants to kill him. Sivagami believes in him blindly and takes a decision to kill baahubali. Learning – In business one should never take a blind decision. One should stick to principal that in god we trust, rest bring data. In Baahubali 2, when Sivagami realized about Bhallaladeva’s conspiracy, she tried correcting her mistake by informing crowd that the baby, Mahendra Baahubali would be new King. She also decided to punish Bhalllaladeva. However, she could not. Learning – Mistakes are part of business, it’s how well you recover from them, that’s make you successful. In the battle scene of movie baahubali it is shown that the army of the opposite party is four times larger than baahubali’s army. However from the beginning army of baahubali does meticulous planning. These planning helps them to conquer victory. Learning – Proper planning is an essential step for getting success in business. Your opponent team may be large enough, but instead of getting panic you should do proper planning strategically for getting success in business. When Mahendra Baahubali couldn’t enter Mahismati palace behind Bhallaladeva, Kattappa ask him to think differently and he makes a strategy to use tree in order to cross big walls. Learning – In business you need to make many strategic moves. You need to keep in mind upside and downside of every move and make a correct move at the right time. Hope this valuable business lessons from Baahubali 2 Movie will help you to get success in business. Do share this valuable business lessons on facebook and twitter.